Agoran is one of the Shifting Isles, originally the southwestern region of the land before the Breaking of the World. Once a democracy, Agoran is now an anarchist society, featuring a completely free market and absolutely no governing body. It is the most technologically-advanced and most prosperous Isle in the world. Though in constant movement due to the shift cycle, Agoran stays mostly along the equator or within the southern hemisphere of the world, giving it comfortable or warm temperatures as the primary sun, Sehryl, travels a strict path around the southern part of the world. It is only when Agoran shifts northerly that the temperatures drop, though the higher altitudes of Agorani cities such as Norton and Dunsberg give those places persistently colder climates. The geography of Agoran varies: snowy ranges in the north (where the cities of Norton and Dunsberg lie), lower mountains and evergreen forests around New Haven in the west, sheer cliffs in the northeast due to the Breaking of the World, and lush valleys just south of the northern ranges, where rivers spill into lakes around Riverside and Laketown. The southeastern region, where Westfield City lies, is drier and bleak due to more direct sunlight, though it’s not nearly as barren as the Isle of Indisar. Not being a country, Agoran no longer has an official flag. However, many people (including the Libertas fleet that originates from Agoran) fly the black-and-yellow flag that represents anarchism: a free market and no government. 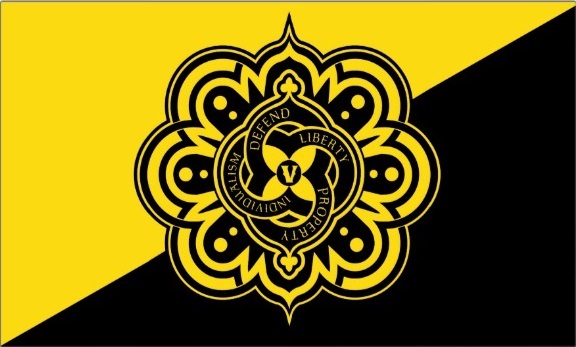 The one depicted here (borrowed from the voluntaryist/ancap movement in the real world) is specific to the Libertas flagship, and reads: Defend Liberty, Property, Individualism.